New parking laws take effect | What Car? New rules come into force in England today to stop councils using parking fines to raise money. The Government has introduced the legislation under the Traffic Management Act, with the intention of making parking rules fairer. As a result, councils are banned from setting targets for issuing parking tickets and wheel clamping will only used against people who persistently evade penalty charges. The new guidelines also encourage councils to tackle dangerous or disruptive parking, such as the unauthorised use of disabled spaces, or parking at pedestrian crossings or on yellow lines. 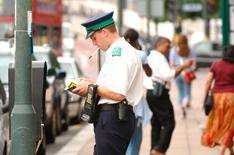 Two tiers of parking fine can also be introduced, with smaller payments for minor offences. The new regulations also include new measures to co-ordinate street works, which should reduce disruption for all road users, residents and local businesses. Under the new regulations, councils can insist that utility companies give longer notice periods before starting work, making it possible to prevent multiple works in different streets in the same area at the same time. Councils will also be able to impose a ban on rush-hour working to minimise disruption.